A pergola is often designed as an outdoor room that provides a light, airy and inviting space to relax, dine or just admire. Pergolas are much larger than arbors and are generally freestanding, but can be attached to another building. You can also add amendments for more shade and to accommodate climbing vines. 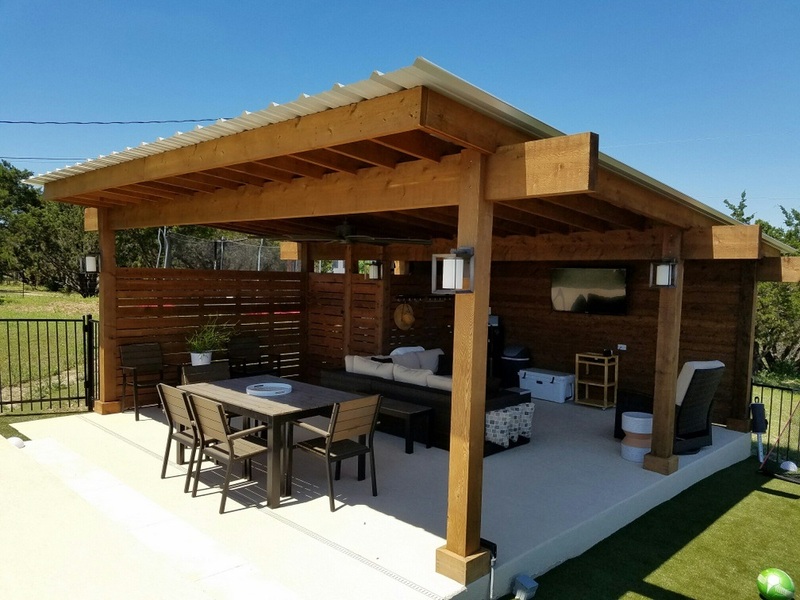 Because a pergola can be freestanding, you won’t need to make any complicated connections between the house or roof and the pergola, which is a definite advantage for many homeowners looking to add an outdoor space to an area within the landscape. 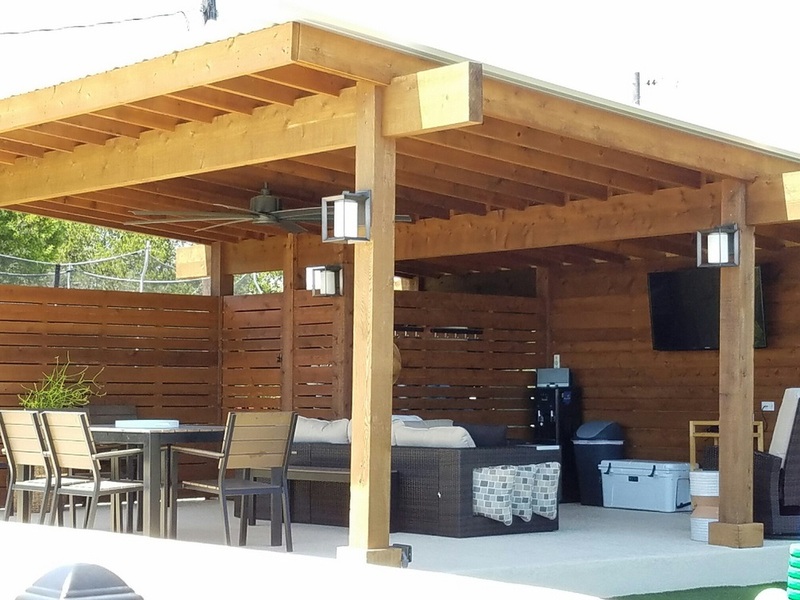 Though this defines a pergola from a text-book perspective, the pergolas we design here at Archadeck of Austin are far from the generic description. Case in point is our pergola addition in Bee Cave, TX, that is nothing short of a modern marvel…. When you imagine a pergola, the first thing that probably comes to mind is an outdoor structure used to generate a variable amount shade and serve as a focal point to a backyard. These are certainly viable benefits of adding a pergola to an outdoor space, however, this pergola is so much more! When we met with the homeowners to discuss their vision, their objective was to get as much covered space as possible within their budget. They were also very specific about where they wanted the lines of the addition to go. This two-story home sits on a hilltop amid their 10 acre homestead with an ” old Texan” feel. 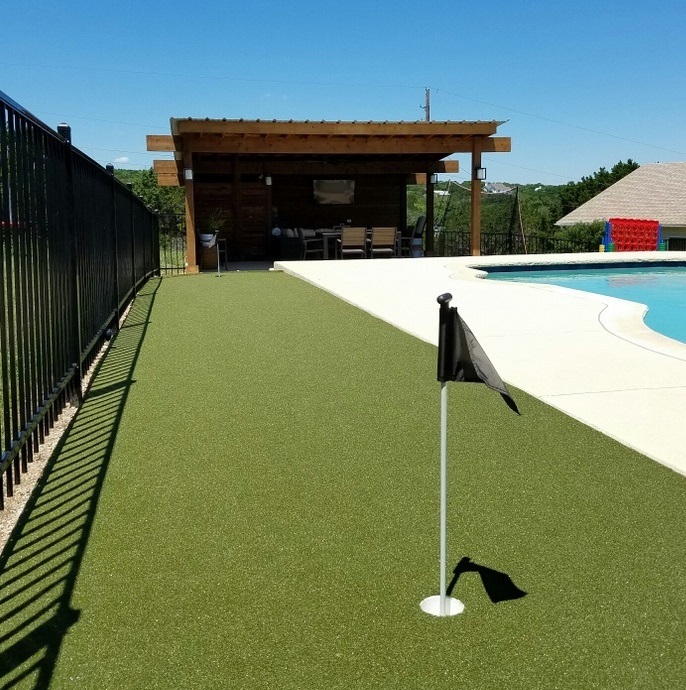 The placement of the covered space was at the end of their spacious backyard pool. The design we were asked to create for them needed to provide versatile functionality and bring more than just aesthetics poolside too. 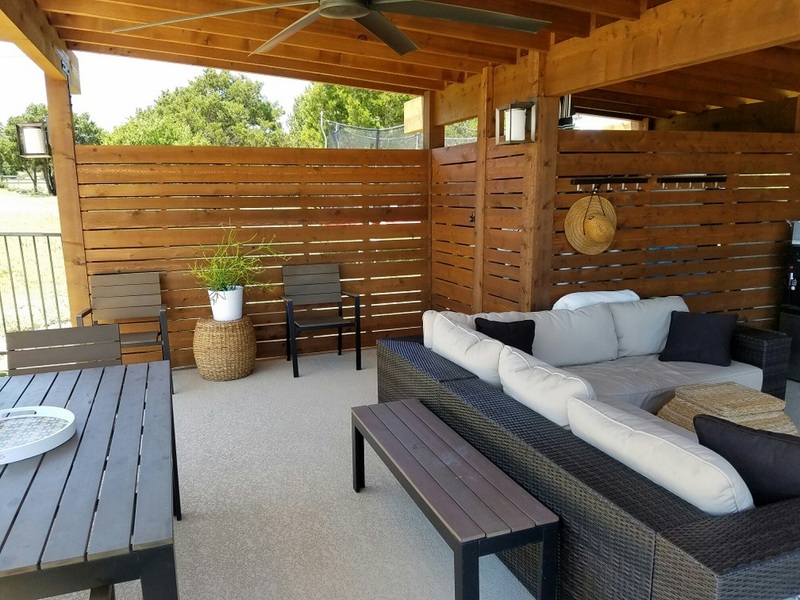 Our talented design team here at Archadeck of Austin are experts at translating the needs and desires of our clients’ into our outdoor living spaces. For this project, we designed a pergola with a metal roof. The interior of the pergola is spacious enough at 20′ x 15′ to facilitate a changing area covered in cedar slats at one end. In addition, the addition serves as the perfect spot for the homeowner’s to store pool supplies when not in use. The pergola also serves as a place for respite and poolside viewing for the family. Plenty of electrical outlets, a large ceiling fan and outdoor lighting make this space right for outdoor living anytime, day or night! The homeowners agree — their new pergola addition scores a hole in one for satisfaction! 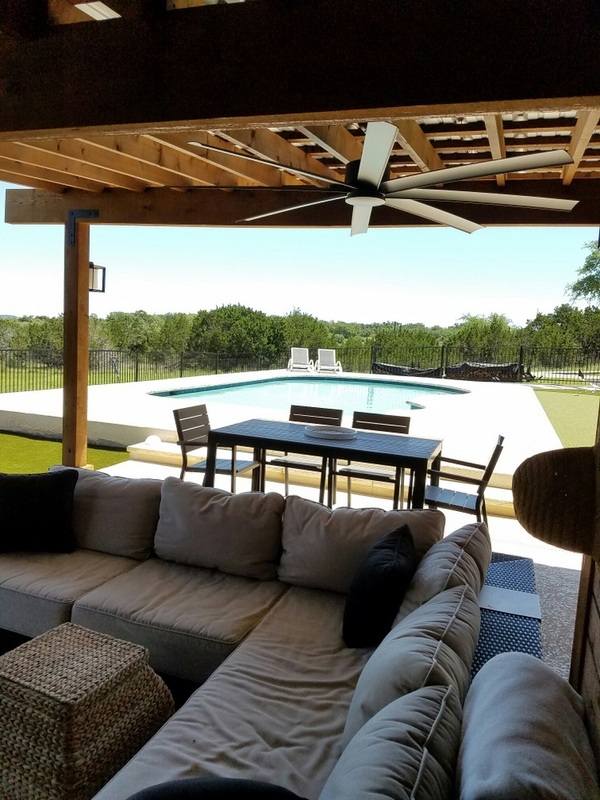 If you would like to learn more about our cutting-edge outdoor living space designs, contact Archadeck of Austin today at (512) 259 – 8282 or email us at jim.odom@archadeck.net. This entry was posted on May 17, 2016 by austinporchandpatio. It was filed under Archadeck of Austin, Austin custom cabanas, Covered porches, Outdoor rooms, Pergolas and was tagged with Archadeck of Austin, Archadeck of Austin design, Austin cabana, Austin Cedar Pergolas, Austin outdoor room, Austin TX pergola builders, Bee Cave TX contemporary pergola, Bee Cave TX pergola builders, Bee Cave TX pergola designs, Poolside pergola addition in Bee Cave TX, Urban Pergola Designs.